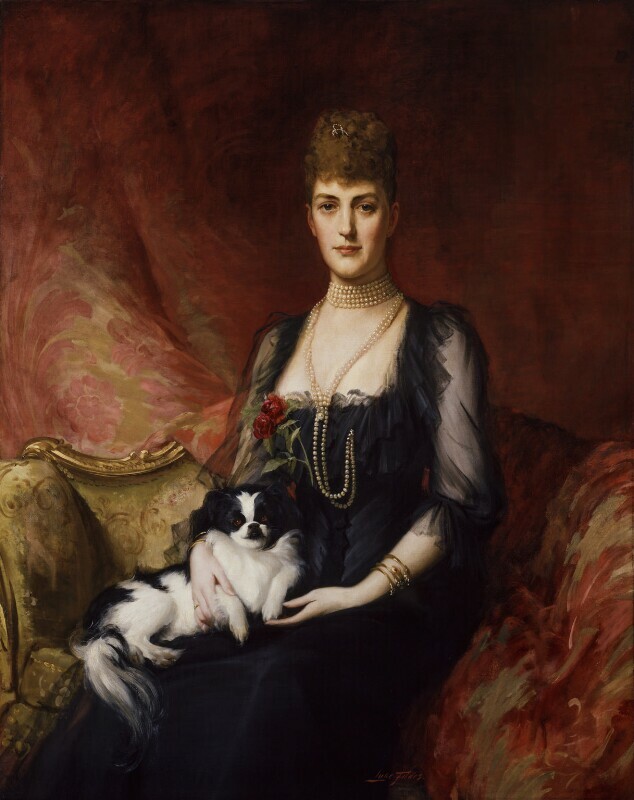 The portrait was commissioned and presented to the Gallery by her son George V in 1920 as a copy from the artist of the portrait originally painted in 1894 for his wedding. The dog, a Japanese Chin, is probably one called Punch, a particular favourite of Alexandra's. Following Gladstone's resignation, Queen Victoria calls on the Liberal MP Archibald Primrose, the 5th Earl of Rosebery to become Prime Minister, a position he reluctantly accepts. His government is largely unsuccessful as the Tory-dominated House of Lords stop the whole of the Liberal's domestic legislation, and his foreign policy plans are defeated by internal Liberal disagreements. The Prince of Wales opens Tower Bridge, built over the Thames to improve access to the growing commercial district of the East End. The bridge was constructed from two bascules, or leaves, which could be raised to allow ships to pass underneath. Rudyard Kipling's hugely popular collection of children's stories and poems, The Jungle Book, is published. The stories, based on Kipling's own experiences in India, have been adapted many times. The arrest and court-martial of Captain Alfred Dreyfus, a Jewish artillery officer, opens up divisions in France over anti-semitism continuing until Dreyfus's exoneration in 1906. The French President Sadi Carnot is assassinated by an Italian anarchist in Lyon. Nicholas II becomes Tsar of Russia following the death of Alexander III. Japan and China go to war over control of Korea, with the more modern Japanese army winning an easy victory.